Like Merchant Ships: Alexandra Stoddard in Nashville! I don't keep a large book collection, instead using the library for 99% of my reading. 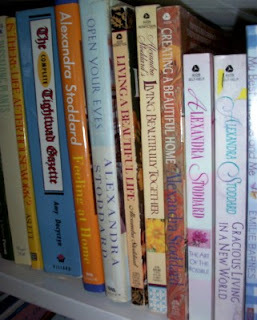 There are a few tried-and-true books I keep on hand for homemaking inspiration. Chief among them are the writings of interior designer Alexandra Stoddard. She's taught me most of I know about color, light, and creating happy spaces. Oh, I nearly drove off the road when my mom spotted the sign outside Lyzon Art Gallery this week. Alexandra Stoddard? Here? I phoned when we reached home. Yes, she will be at Lyzon to sign books this Monday night from 6 to 8. Tuesday night she'll give a short talk at Davis Kidd and sign more books then. Last time Stoddard came to Nashville, I couldn't afford tickets to her lecture. Now, I can enjoy a free browse through the gallery, refreshments, a pianist, AND a favorite author? Color me pink. I always thought your writing and inspiration were 'Stoddard-like' Have a great time! 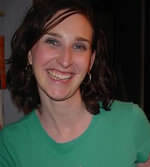 I worked for Barnes & Noble a few years back and had the lovely privilege of hosting a book signing for Mrs. Stoddard. She is a lovely woman and I was so excited that I was able to meet her! I owned every book she had written at the time, and she graciously signed them all! Have fun! You will love her! Meredith - That bookshelf looks so familiar! Those are some of my favorites, too. I just love her books- not only do I learn so much but they are so beautiful and relaxing to read! Have the BEST time, Meredith! You deserve it! I love her books and her attitude towards decorating. Thanks for the links, too...I'm going back later to read. i love alexandra too! i have all her books- i just bought one for $1 at goodwill!!! !